The new AmeriGlide Platinum Curved Stair Lift is also available in a HD version! With an increased weight capacity of 352 pounds, the Platinum HD allows virtually all multi-level home owners to make their stairs handicap accessible without the use of elevators or vertical platform lifts. If you have multiple landings, spiral, 90-degree, 180-degree, or anything other type of staircase, the Platinum HD curved stair lift is the answer for you! The Platinum HD is designed to be as discreet as possible and blend in with your home just as any other piece of furniture would. This compact model even comes with a folding seat and footrest that will free up even more room on your staircase when the lift is not in use. In addition, you will love the comfortably designed padded seat as well as the twin rail mechanical leveling system that offers a smooth ride around landings and corners each and every time you use your lift. Safety is a top priority for AmeriGlide, so every Platinum HD comes with a seatbelt, pressure sensitive footrest and carriage, and a swivel seat that transferring in and out of the seat as easy as possible. Multiple sensors are on the stair lift itself will detect and avoid obstructions that might pose a safety hazard. Finally, key lock switch comes in handy for when you need to keep unauthorized people, like curious grandchildren, from using the lift. AmeriGlide stair lifts are known for their exceptional craftsmanship and the Platinum HD Curved Stair Lift is no exception. We are very excited to bring one of the first curved stair lifts to the online market place and we know that you will love having this amazing heavy duty stairlift in your home. 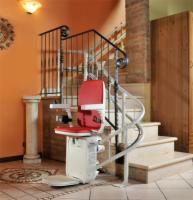 To learn more about your options and order your Platinum stairlift, contact one of our stair lift experts today! Check out our full installation video!